Is Front Seat The Safest Place To Sit In a Car? Recent crash tests indicate that although SUVs might have passed safety standard tests for individuals in the driver’s position, passengers may not be receiving the same protections in the event of a crash. 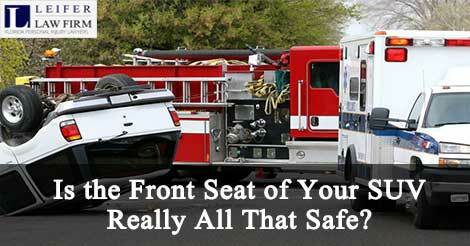 The present major question is that front seat the really safest place to sit in a car. A major accident could lead you to wind up in the office of a Boca Raton vehicle accident lawyer, filing a claim for compensation. Research from the Insurance Institute for Highway Safety carried out front overlap crashes with seven different SUVs that it previously received solid ratings for accidents involving the front driver side corner when the vehicle slammed into a barrier at 40 miles per hour. During this particular round of testing, however, the Institute was looking at how the crashes would impact the front passenger side of the SUVs. The results were astounding and indicate that while you might be safe in the event of a crash, your passengers may not be. Only two of the models who had previously succeeded in other rounds of testing were rated as good and one model was ranked in the poor category. The Toyota RAV4 was ranked as good for crash involving the front driver’s side, however it scored as poor for the individual in the passenger seat. The difference between passengers and drivers is partly due to the fact that some auto manufacturers put more emphasis on the structure and vehicle frame on a driver’s side in an SUV. This is because when front overlap crash tests were first introduced four years ago, the primary results measured in these tests had to do with what happened on the driver’s side corner of the vehicle when it slammed into a pole or another car. Why do passengers matter so much in vehicle accidents? In 2014 alone, more than 1600 individuals were killed in accidents while sitting in the front seat of a vehicle. That represented more that 13% of all fatalities inside vehicles for that year. If you have been involved in an accident while a passenger in someone else’s vehicle, you may have questions about filing a personal injury claim. Depending on who is responsible for the accident and the severity of your injuries, you may be able to pursue a personal injury claim against the driver of your vehicle or the driver of another vehicle. If you’re hurt in an accident, your Personal Injury Protection coverage required under Florida laws will kick in to pay the first $10,000. In a severe accident with major injuries, however, you can end up with medical bills far beyond this cap. If you find yourself in this situation, don’t give up hope. Instead, set up a meeting with a Boca Raton vehicle accident attorney so that you can discuss filing a claim beyond what’s already been covered by PIP. When your costs exceed the cap, you may be eligible to file a personal injury claim to recover additional compensation. In the case of someone who has been seriously injured, this personal injury claim can be crucial for allowing him or her to recover as much as possible from the accident. These cases can become complicated quite quickly without the insight of a Florida personal injury attorney. Given that a personal injury accident involving a passenger in a vehicle can lead to injuries that impact you for the rest of your life, it is in your best interests to consult with your medical team about their projections for how you may recover from these injuries. Then it’s time for consulting with a knowledgeable personal injury attorney about your rights. Filing a personal injury claim for compensation may help you cover your medical bills and other costs associated with your inability to work and enjoy life after an accident. Car accidents are a leading cause of injury and disability across the United States and if you have recently sustained injuries as a result of someone else’s negligence or reckless behavior, you may have grounds for a personal injury claim.